Don’t try to to get in touch with me tonight…for I will be in combat. The virtual kind thanks to Battlefield 3, which was released today and man oh man is it good. No silly Xbox 360 or PS3 version here…straight up PC…the only, and the best, gaming machine that truly matters. Even know in the end I will probably have more deaths than kills…I will be grinning ear to ear in the process. Check it out if you are a gamer…you won’t be disappointed. And what will my beverage of choice be to enjoy with Battlefield 3? 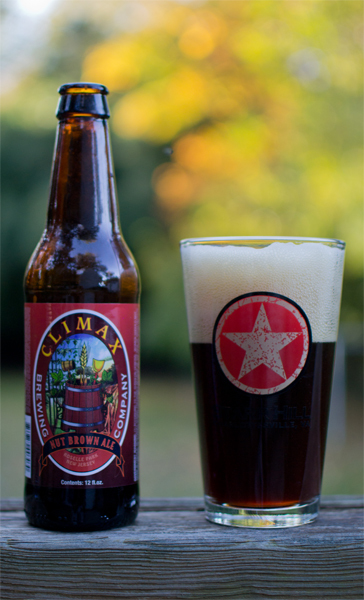 Why Beer #331 is Nut Brown Ale from Climax Brewing Company from New Jersey. Their version of an English Brown Ale has an ABV of 5.2% and I hope goes along well with some fraggin’. Appearance – Dark brown color with a bit of ruby red when held up to the light. The head was massive, tan colored and oh so fluffy. Nose – A nice roasted caramel malt aroma with a bit of chocolate. I also got a floral hop thing too…interesting. Taste – The roasted malts come out first in the taste with a mix of chocolate and caramel. There was a bit of a coffee flavor also…but not very strong…just there. A bit of dark fruit…raisins maybe? Kind of a roasted nut finish to it. Mouthfeel – A bit thin body wise and pretty low in carbonation. Nicely bitter. Very drinkable in that the glass was gone way too soon. Overall – I enjoyed this and just wish it was a bit heavier in the body. This was another really good beer from Climax. It is really cool to see Climax start bottling in 12 oz bottles to compliment there 1/2 gallon growlers. If you live in New Jersey…seek out some beer from Climax Brewing Company. In my opinion, they brew the best the state has to offer. The next few beers I will be having were a birthday present from my mother and brother. They know I like beer, so they got me a three month Beer of the month club. The first month just arrived and with it are 12 beers. Two selections from Michigan Brewing Company and two selections from Shipyard Brewing Company with 3 beers of each selection. Tonight for beer #276 I will be trying Michigan Brewing Company’s Nut Brown Ale. This English Brown Ale is brewed in Webberville, Michigan and has an ABV of 5%. This beer had a dark brown color with red highlights. The head was a decent size, about two finger width, with an off-white color. The nose was on the light side but I was able to pick out some toasted caramel malts, a bit of chocolate, and a nutty earthy aroma. It opened with those sweet toasted caramel flavors with maybe a bit of brown sugar. Those flavors it opened with faded fairly quickly into a something very much like cold coffee. It had a medium body, low carbonation, and was bordering on being creamy except for a slight harshness. Overall this was better than I was expecting it to be. It was pretty tasty and satisfying and made me want to drink the other two. Now I’m looking forward to their other selection, their version of a Hefeweizen. Oh yeah…a big thank you to my mom and brother just in case they are reading this!!! I love the present!!! What a weird day today. The morning started off on the mild side with the temps hovering right around 40 degrees. I was thinking, maybe spring is truly on its way. But that all changed as I left work to a bitter biting cold, it must have been less than 30 degrees. Sun, warmth, greenery…thats all I’m wishing for now. 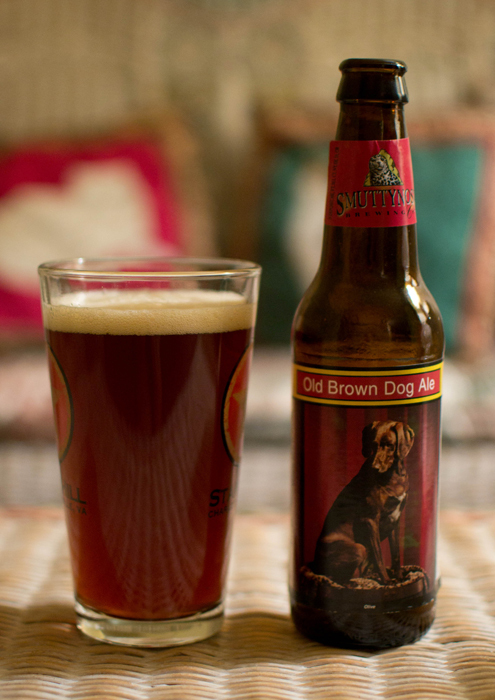 Beer #72 is Old Brown Dog Ale by Smuttynose Brewing Company. 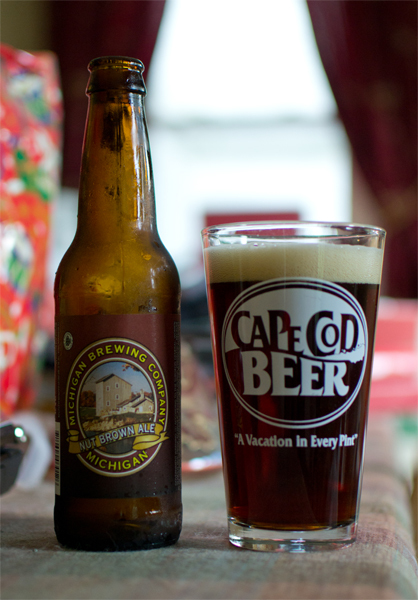 Smuttynose, located in New Hampshire, brews this beer in the style of an English Brown Ale. The ABV checked in at 6.5%. Pictured on the label is Olive, the mascot of Smuttynose. Sadly, Olive is no longer with Smuttynose as she passed away in 2007. Into my old stand by Starr Hill pint glass I poured this brown liquid. It had a reddish cast to it when held up to the light. There was a head of about a finger width in size. I took a whiff hoping it wouldn’t smell like a wet dog and I am happy to say it didn’t. The nose mostly consisted of roasted malts and a nice nutty aroma. It was a very pleasant beer to smell. The nutty flavor, up front in the taste, was more pronounced than the roasted malts. I also got something slightly sweet and fruity towards the middle of the sip. It finished up a bit on the bitter side. That bitterness lasted quite a long time after the sip was swallowed. It had a medium body with moderate carbonation. It was quite easy to drink even for me as English Brown Ales usually aren’t my thing but I think they may be growing on me. Beer #59 is Turbodog by Abita Brewing Company. Abita does their brewing in Louisana. 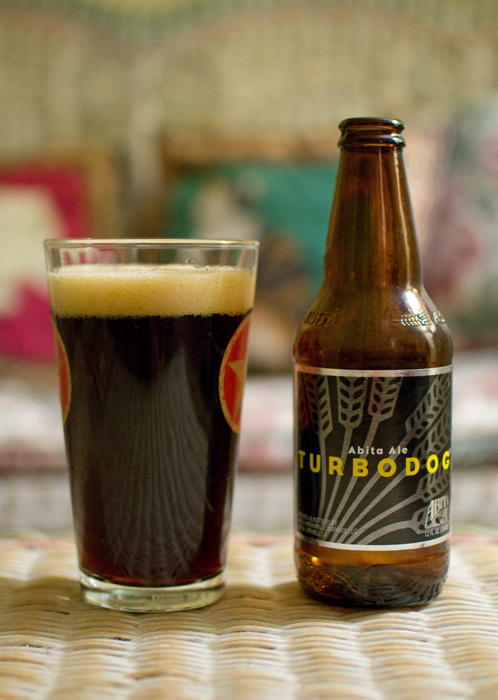 Turbodog is an English Brown Ale with an ABV of 5.6%. Turbodog poured a very dark brown leaning towards black. There was a one finger width head but it dissipated very quickly. It left none of that awesome lacing I like to see. The nose was just about non-existent with just a bit of faint caramel and roasted malt aromas. It tasted like a very weak cold coffee with just a bit of some roasted, semi-sweet malts. The body was really light, almost watery. It was very easy to drink, so easy that I think this may have been the fastest I have finished a beer in the first 59. Overall it was a very average beer. Nothing in here makes it horrible or undrinkable just unremarkable. This is my third English Brown Ale and it was my least favorite. 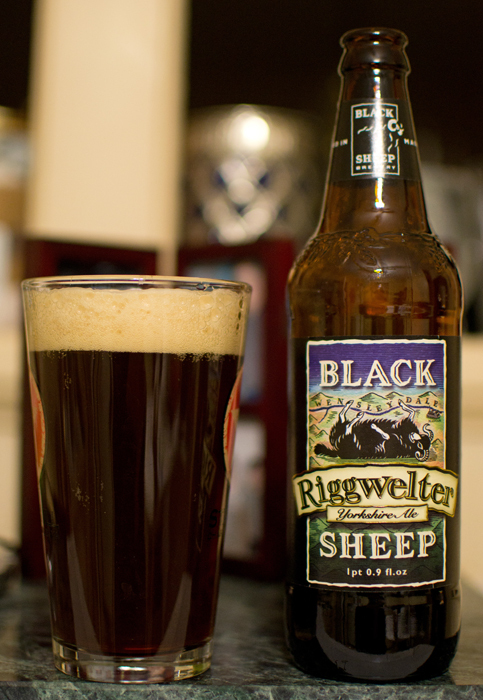 For a much, much better English Brown Ale, check out beer #50, Riggwelter Yorkshire Ale by Black Sheep Brewery. Beer #50, only 315 to go, is Riggwelter Yorkshire Ale by Black Sheep Brewery. Riggwelter is brewed in the style of an English Brown Ale with an ABV of 5.7%. Riggwelter is an odd word so to the bottle for the meaning. Deriving from Old Norse, rygg (back) and velte (to overturn). It was said that when a sheep was on its back and could not get up it was riggwelted. Hench the label with the overturned black sheep on it. The appearance was a dark brown, almost ruby red when held up to the light. There was quite the off-white head topping this beer off. To the nose it went and I was greeted with roasted malts, caramel, coffee, and something nutty. The time to sip was at hand and I was rewarded with a dark fruit sweetness and those roasted malts that remind me so much of coffee. There was also a nice dark chocolate thing going on with smoky type flavors near the end. There was a bit of hop bitterness in this I liked also. The beer had a decent body, not to thin or too heavy, with some light carbonation. It left me wanting more. This was very drinkable, good flavor, nice aroma, nice and smooth…please sir…can I have another? I’m not usually a fan of Brown Ales but this is my favorite. Good stuff indeed! Beer #29 is Thunder Hole Ale by Bar Harbor Brewing Company from the great state of Maine. 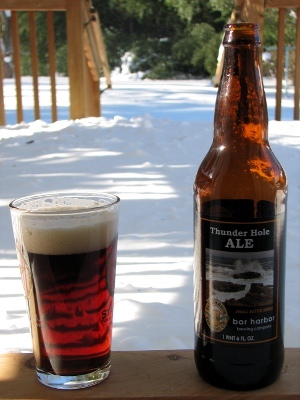 Thunder Hole Ale is an English Brown Ale with an ABV of 4.8%. I’m not a big fan of Brown Ales but I am a fan of Bar Harbor and the surrounding area. Thunder Hole in Acadia National Park, depicted on the label, is a very cool place to visit. Into the pint glass it went with a very nice dark reddish brown color. There was quite the tan head on this one. Lacing was excellent as it clung to the glass for the whole 22 ounces of this beer. The nose was filled by sweet roasted malts, some coffee and a bit of smokiness. Malt, malt and more malt in the taste finishing off with a bit of coffee. Mouthfeel was really nice, very smooth with a medium body and some nice bubbles on the tongue. This brew is a very easy one to drink. It would make a nice session beer. Although I didn’t want another after this bomber. Thunder Hole was an OK beer but kind of forgettable for me. The real Thunder Hole in Acadia is quite the opposite.